Living in Melbourne and loving fashion as I do, it’s hard not to get swept up in the magic of the Spring Racing Carnival. So when Estelle asked me to be her plus-one at The Westin Moët & Chandon Melbourne Cup breakfast, I could hardly refuse. 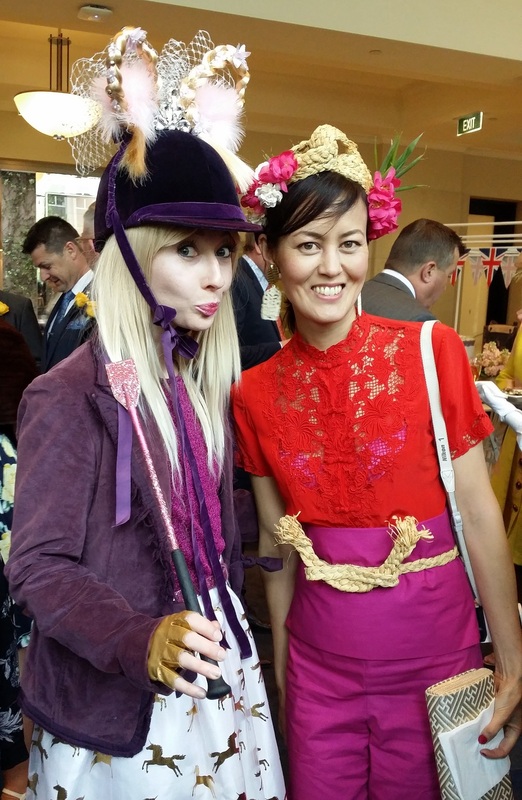 A fancy event where we get to dress up, eat delicious morsels and hang out with friends such as The Human Chameleon (without actually having to go to the racetrack or watch any horse racing) – count me in! Most ladies spend significant amounts on their race outfits, but I am not most ladies. 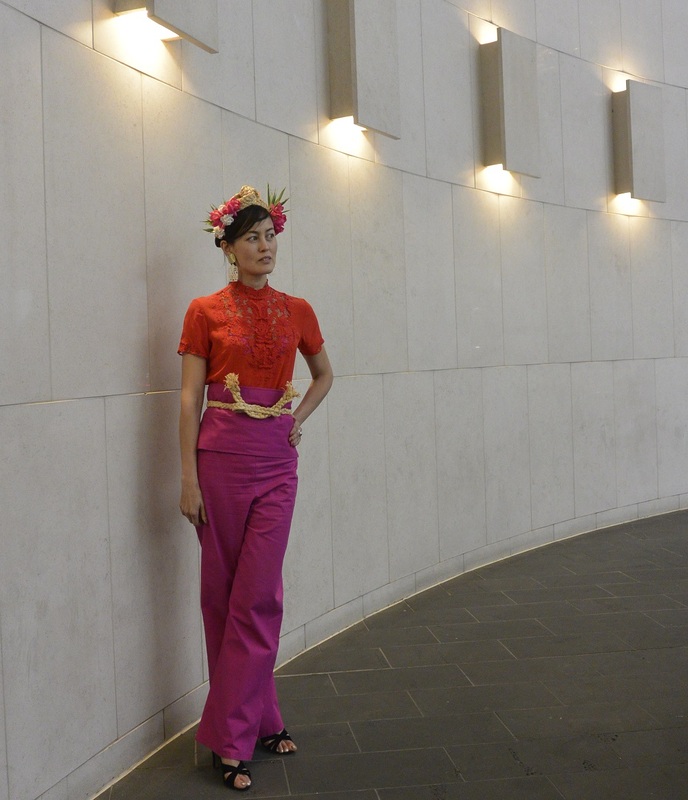 Having found the reddest of red Chinese silk blouses for $10 at Waverley Antique Bazaar a few months ago, I couldn’t wait to build a racewear-worthy oriental look around it. 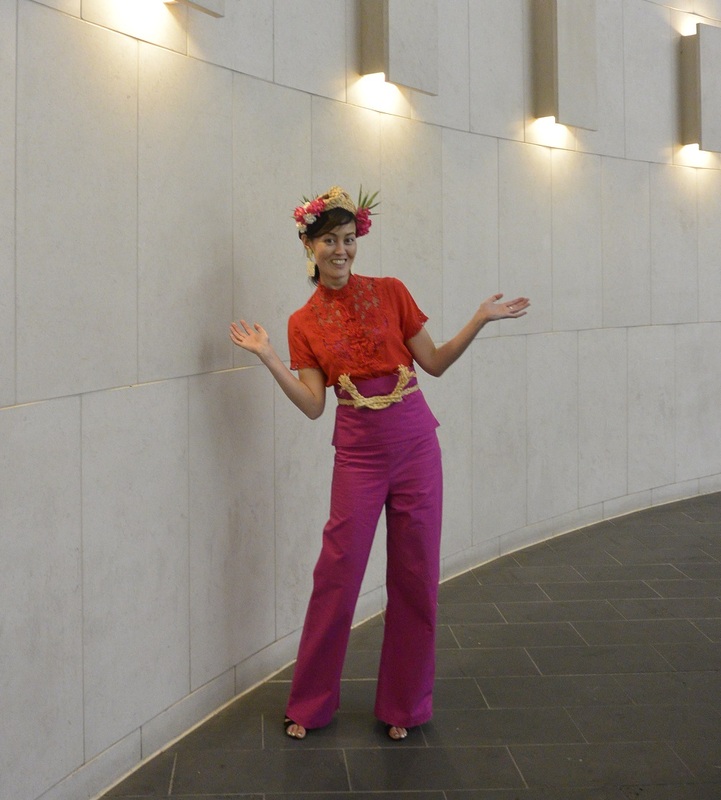 Out of my wardrobe came the shocking pink pants I made a few years ago and out of my fabric stash came the remaining material (originally from an opshop), from which I created a kind of fitted obi/cummerbund. The clutch was about $1 at a flea market in Japan and I made the earrings a while ago using opshop clip-ons and parts taken from some necklaces left over from my dad’s 1970s attempts to import accessories (they have Chinese characters for “luck”, “double happiness” and so on carved into them). I’ve forgotten how much the shoes were but they were from the same opshop that the pink fabric came from … maybe $3. And the all-important millinery arrangement? …and stitch them into place (you can see how rough the stitching is, my finger is pointing to it in the photo). I covered the loose ends of the straw in black stretch fabric from the seams I cut off a dress recently (waste not, want not!) and stitched some hat elastic on so the turban would sit securely on my head. 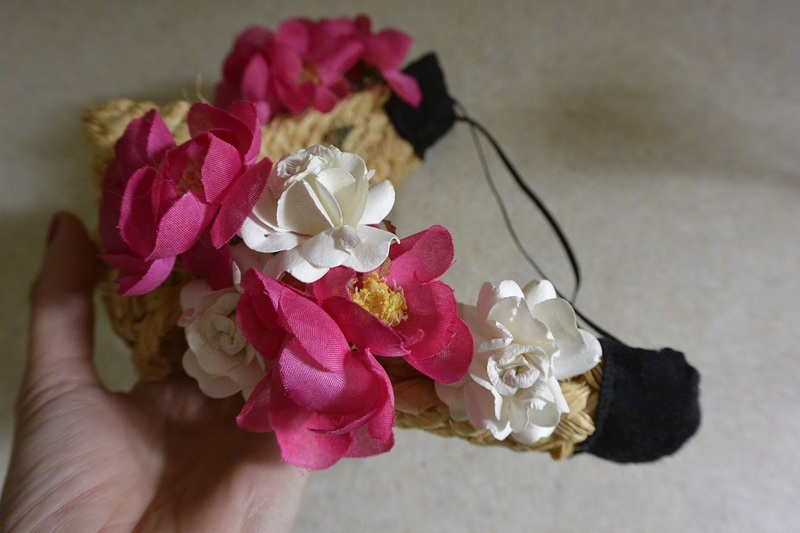 The pink flowers had originally been used on a headband when I hastily had to put something together for a photo shoot about cheap racewear (you can see the original headband, plus the little Cox Plate hat, and read more about how I hate spending money here). I removed them so I could use them on this turban, along with some white papery blossoms that I once wore to a wedding (and which these days sit on a shelf in my room, occasionally being nibbled by my cat when the mood takes him). 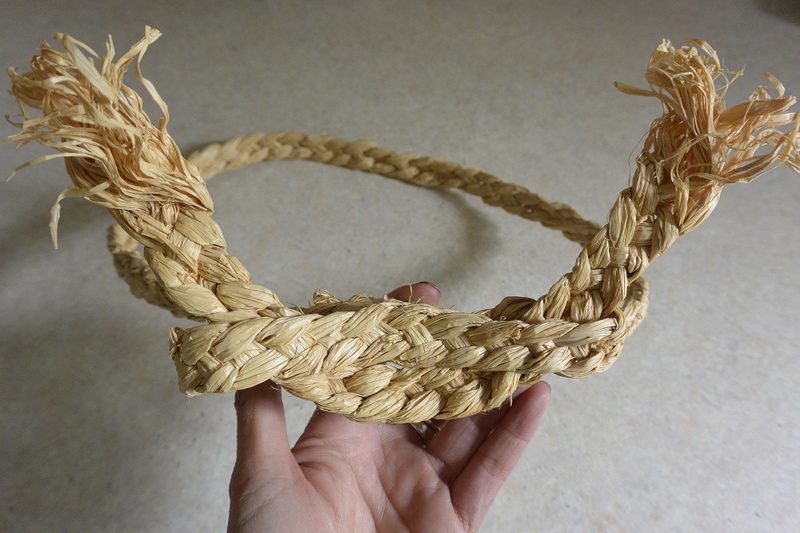 Loosely plaited straw like this is fairly easy to work with as long as you don’t mind what the underside of the head piece looks like – all I did was poke the stems through and either wind the wire up or roughly stitch the plastic stems into place. 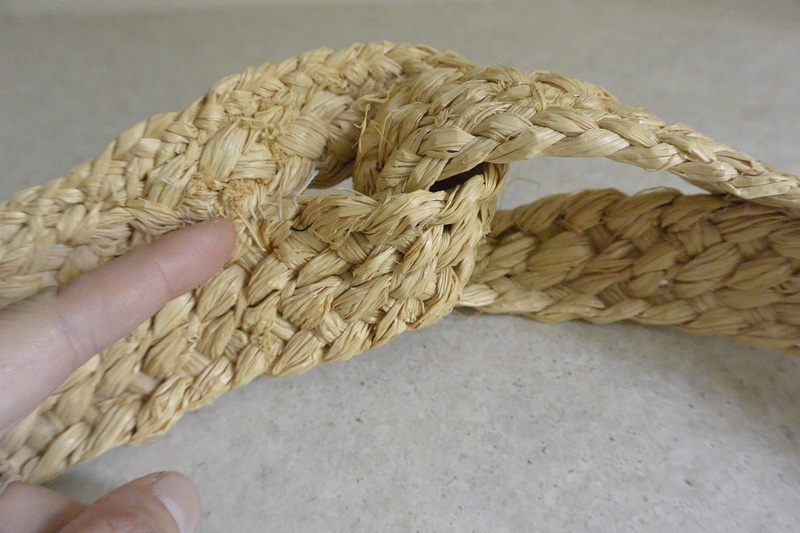 To complete the outfit, I altered a straw belt that I’d made for my Cox Plate outfit by running a length of straw braid through what was originally a bow. Just to make sure the oriental theme was obvious, and to temper what was a very vivid look, I snipped some bamboo from the garden and worked it into the turban at the last minute. Ta da! There’s another Spring Racing outfit for around $20. I was pretty happy with how this turned out because I can easily wear the same outfit – or parts of it – for other functions. Simply removing or changing the flowers in the turban will update it to match whatever I wear it with next, and the obi simultaneously gives the pants a more interesting look and covers up the waistline (the 70s pattern I used to make them had the waistband sitting snugly up around my ears so I removed it and cut off a bit of the waistline to make the pants more wearable, but I seem to have lost centimetre or two around the belly since so now they are too loose and the waistline won’t sit properly. Gah.). Anyway, if you’d like to see this look in action and check out what other attendees at The Westin wore (and see the scrummy food), there’s a little video here. It goes without saying that I had a great time – I’m already dreaming up an outfit for next year! What a great outfit- love the color combo! Bravo! 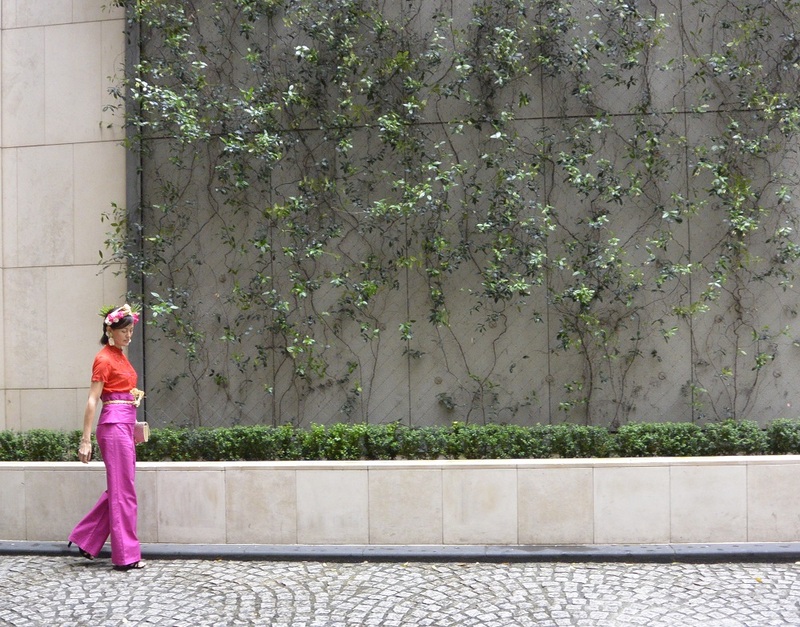 Another amazing, creative, thrifty outfit in one of this season’s (and ever’s) best colour combos – love it!